One of the key aspects of creating meaningful tests is being able to run them against different environments, to make sure that the upcoming release will pass the tests designed for the production release. To do so, API Fortress introduced the “Environments” feature. An “environment” is a collection of override variables. An override variable is a variable that will replace the value of a variable that has been hardcoded within the Vault or the test itself, during a predefined session. By doing so, you will be overriding the variables for the current session, as long as the preset is activated. This override will be performed to your session only. Once your preset is ready and you are willing to save it for later use, you can click on the “save” button and give it a name. 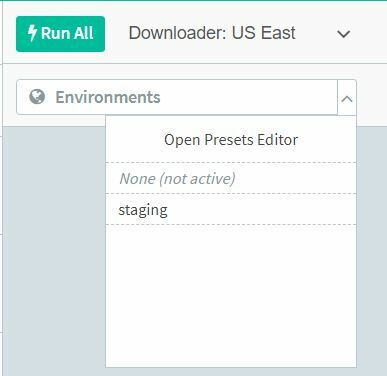 The Preset will be associated with the current project and will be available to you and the other users. Once your environment is saved, you can activate it by choosing it from the “environments” dropdown that will show up by clicking on the arrow-down, to the right of the environments icon. In this example, we named the environment “staging”. To disable the environment and go back to defaults, just select “None”. When using the API by invoking a test execution, you can have API Fortress load an environment based on its name.